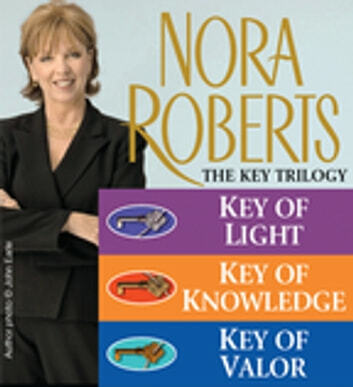 Fate brings three women together for a chance to unlock their deepest desires in this collection that includes all three novels in the Key Trilogy from #1 New York Times bestselling author Nora Roberts. Legend has it that the souls of three demigoddesses have been locked in a box that has three keys. It all seems too bizarre to be true. But the women tasked to find them can't ignore the promised reward: a million dollars each. Malory—with her soul of an artist and eye for beauty—must find her key first. She soon discovers that whatever locked the souls away is dark, powerful, and greedy...and it doesn’t want the women to win. As Dana finds herself on the threshold of major change, it’s her turn to find a key. She has four weeks to unravel a riddle involving her past, present, and future, and to find the truth hidden among deception and lies. As a single mother, Zoe has more to risk, more to lose. Now, she must gather all her courage to confront the dark forces amassed against her to find her key and make all of their dreams come true. great for bedtime reading. nice to turn a page in a fantasy story. helps you relax and unwind after a long day. I always love when Nora writes a set. Although as far as this one goes it took me the first book before I got into the story. don't get me wrong I did enjoy the trilogy but I was not sucker right in like I usually am. Probably a 4.5 star for this book but it entertained me and took me away so it gets a 5.